Hey there folks, Tash Moore coming at you with my pick of the week. Now, those of you who really know me (one person) knows that there are two heroes that I can’t help but read. Marvel’s Spider-Man and Batman from DC. What can I say? IF I started reading it in 1994, it’s pretty much stuck with me all this time. Pretty much like taking a bath or refusing to pay my taxes. Hey, it’s science. You can’t fight it. Ahem. All jokes about tax evasion aside, (Snipes!) I went with Detective Comics #35 as my pick of the week because it’s no doubt a modern comic, but it has classic sensibilities. In part, it feels like a Batman comic I’d read as a kid. No major bad guy showing up, just because, and no die hard embossed cover needed here gang. It’s Batman, doing Batman things. Like handing out beatings like rice pudding. I bet that makes the holidays at Wayne Manor pretty tough on ol’ Alfred. In this tale which is going to be told in what I guess is a two part story (Remember those? DC sure doesn’t.) Bruce Wayne is being forced to take a vacation away from Gotham City. Not that it’s his own idea mind you, but it’s Alfred’s. So while waiting on the tarmac, I assume Bruce is going somewhere warm to work on his tan. He did that when Robin was stuck in Gotham going toe to toe with the Joker. I’m pretty sure it went something like that. Or not. So a plane crashes into the side of Gotham International Airport. You know, that’s pretty much cause for alarm. So Bruce does his thing and changes into Batman. GCPD are in route and the Gotham Airport police close off the area. 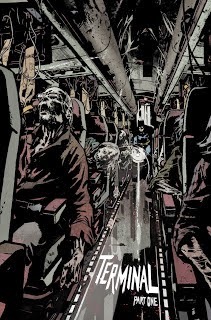 Batman shows up and enters the plane only to find out that a virus on board has killed everyone. Batman fearing that everyone is infected growls at the Airport police to quarantine off the Airport. Smooth move, Bats. You doomed all these people by opening the damn plane door. I bet he’ll leave that one off his Justice League resume. On the giant screen an Eco terrorist is waging war on Gotham and says that Gotham Airport will become a mass grave soon. Now it’s a race against time to save not only everyone in the airport but himself, putting Batman in a very tight spot. The writing was well paced, which is a nice touch after having so many comics try to cram so much only into so many pages. This Benjamin Percy fellow has a career ahead of him. John Paul Leon has always been a pretty much underrated artist. His cover on this issue is great. It really reminds me of Bernie Wrightson’s Batman and his Horror comics covers that he was famous for back in the 1970’s. It’s a moody atmosphere, that goes great with the drama of Batman’s fate being tied to everyone in the airport. My hairy brown thumbs are…..way up!